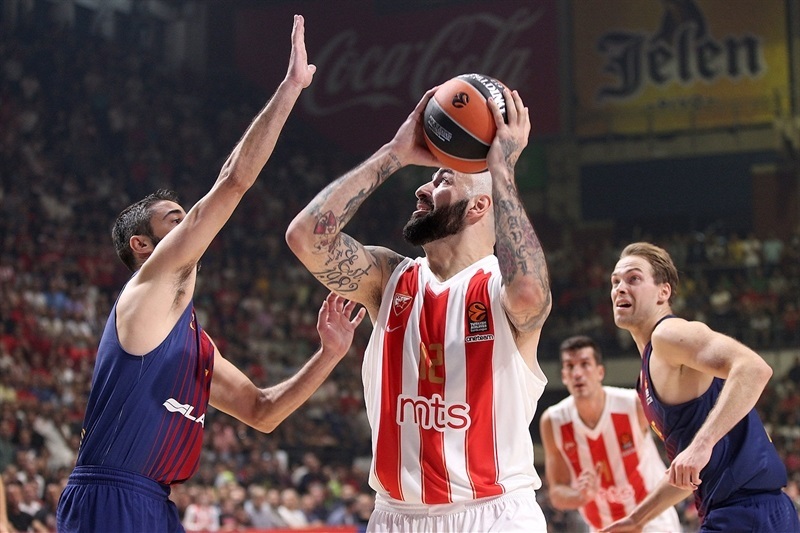 Crvena Zvezda mts Belgrade used a perfect opening and a strong finish to make for a memorable home opener, holding off FC Barcelona Lassa 90-82 in front of a capacity crowd at the legendary Aleksandar Nikolic Hall on Friday night. 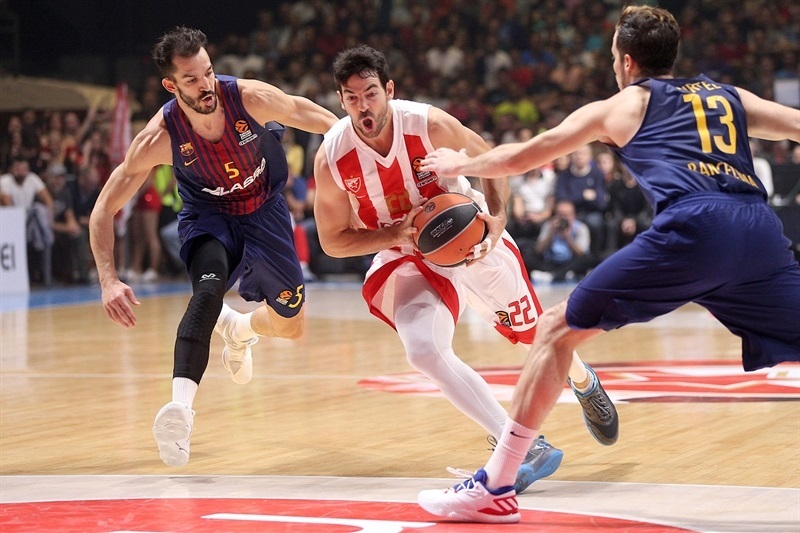 Both teams hold 1-1 records in a young Turkish Airlines EuroLeague season after a game which Zvezda opened with 24-11 lead, and repeatedly kept restoring its double-digit lead throughout the night. 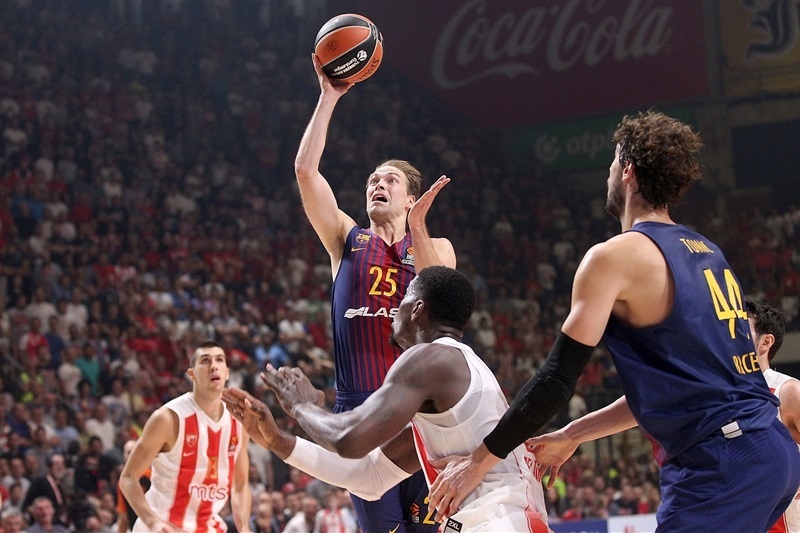 The margin was 55-41 midway through the third quarter, but Thomas Heurtel fueled Barcelona’s comeback. The visitors erased the deficit in the fourth quarter and went up 79-80 with 2:50 to go. But the hosts finished the game with an 11-2 run to clinch the win. Milko Bjelica led Zvezda with a career-high 23 points, and Taylor Rochestie had 22 points and 7 assists. 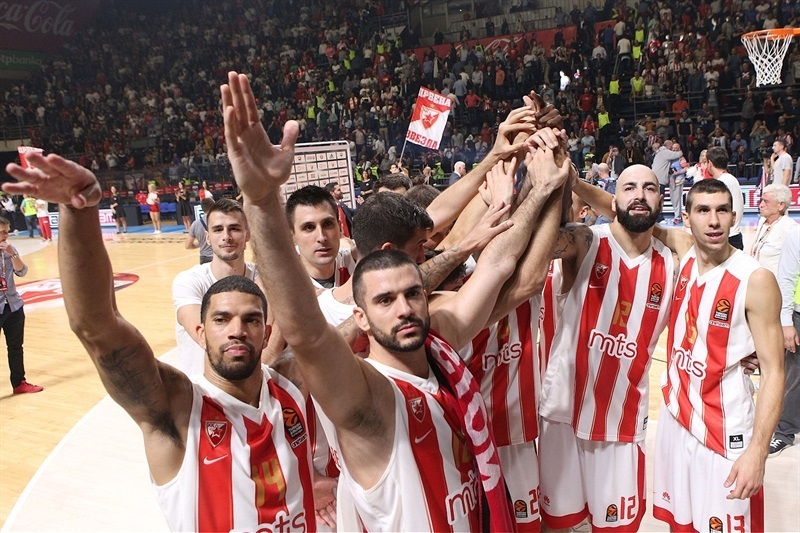 Big man Mathias Lessort collected 13 points and 9 rebounds, while Pero Antic had 10 points and 9 rebounds in victory. 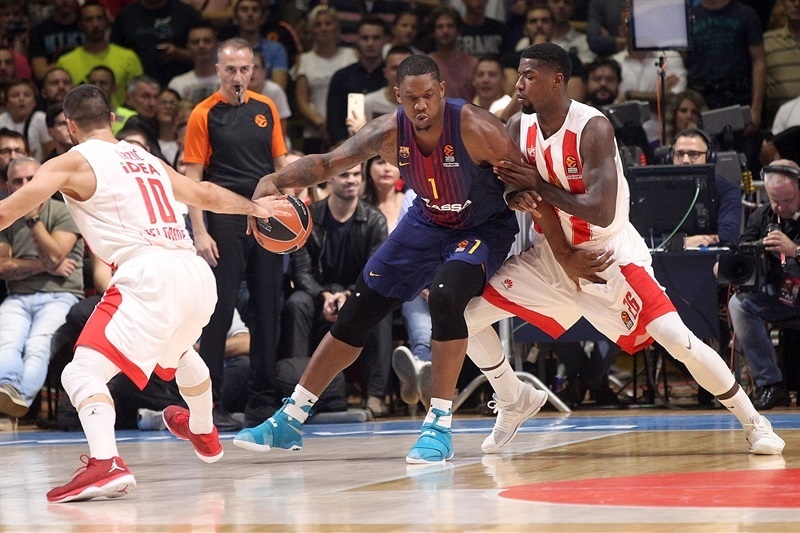 Kevin Seraphin scored 12 of his 16 points in the first half for Barcelona, while Heurtel scored all of his 14 in the final 15 minutes and also dished 11 assists. 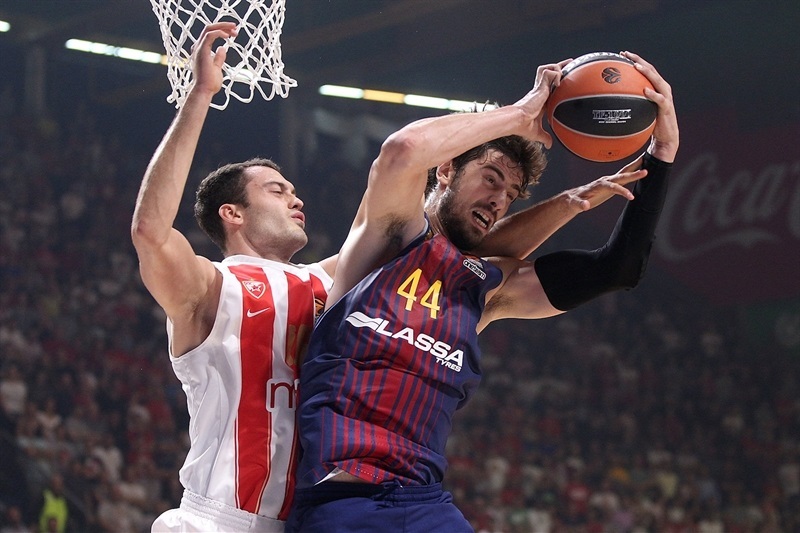 Ante Tomic had 10 points and 8 rebounds, while Adam Hanga also scored 10 for Barcelona in club's historic 400th EuroLeague game. Zvezda converted on its first six possessions, with Bjelica hitting a triple to start the game, Rochestie adding a pair of baskets of his own, before Lessort finished a fastbreak with a big dunk that made it 13-7 and delighted the home fans. 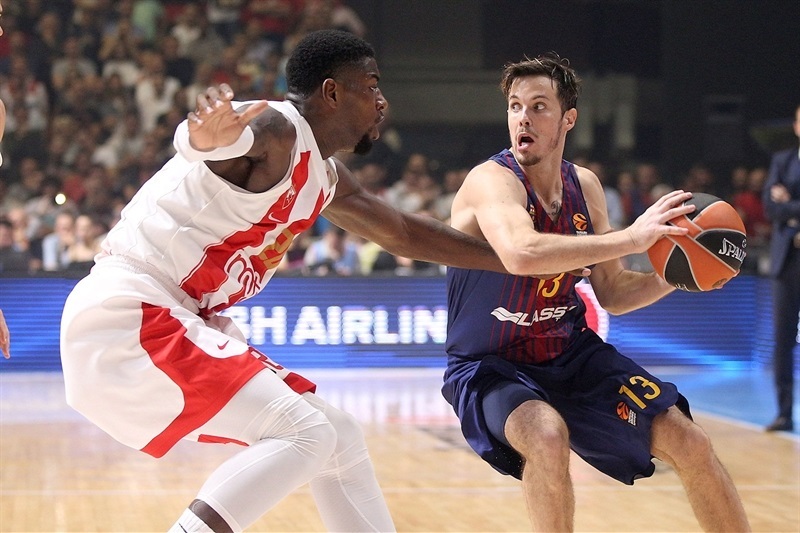 While Barcelona was looking to find its offensive rhythm, Ognjen Dobric nailed a corner triple and Bjelica’s dunk already helped open a 24-11 lead. 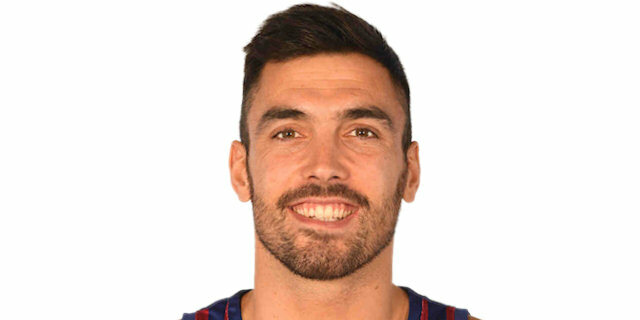 Tomic finished the first quarter driving the lane for a dunk and Petteri Koponen hit a three early in the second, but a triple from Antic on the other end, followed by a Rochestie’s floater, restored a 13-point lead, 33-20. Barcelona found its go-to guy in Seraphin, who scored 10 of the next 12 Barcelona points, hitting jumpers and converting inside. The visitors came to within 33-28, but Bjelica got Zvezda going once again before Rochestie hit a pair of triples in the final 90 seconds of the half, giving the hosts 44-32 halftime lead. 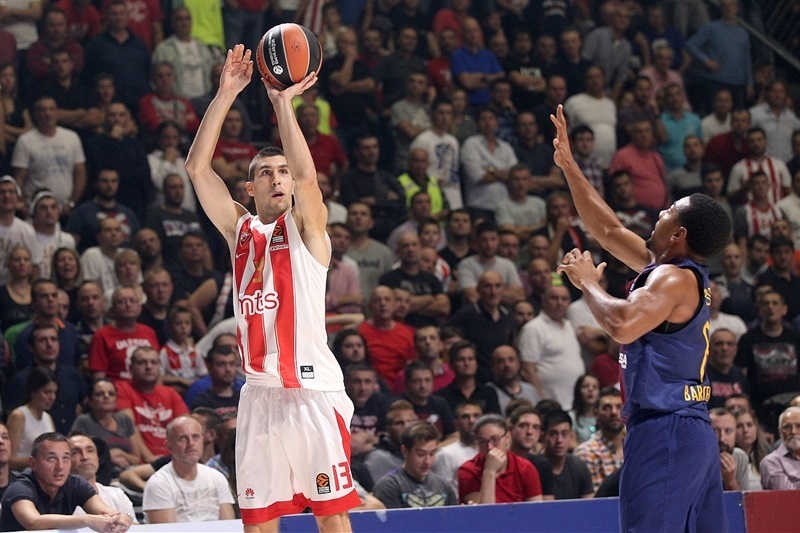 In the third quarter, Zvezda continued where it left off. 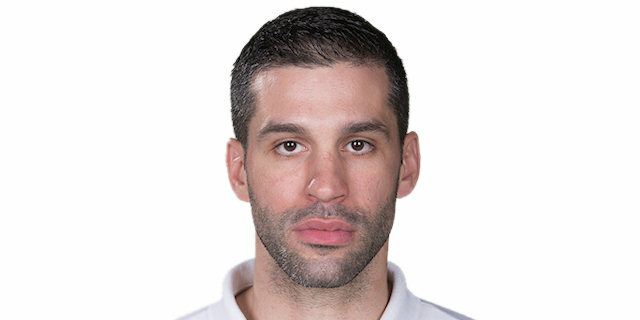 After Adrien Moerman hit a triple and Seraphin scored from close range for Barcelona, James Feldeine had a three-point play and a jumper that helped make it 55-41. That when Heurtel opened his tally, later hitting a triple and a running floater. 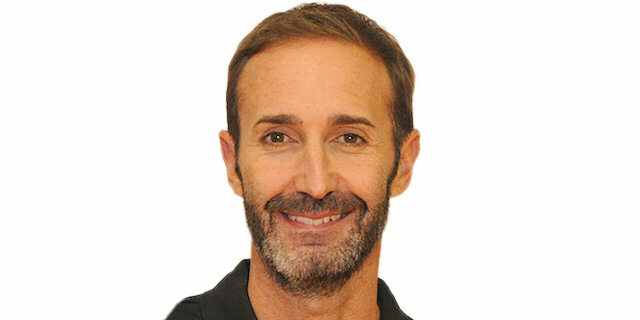 Pierre Oriola's three-pointer in the final minute of the third quarter cut the difference to 62-57. Back-to-back three-pointers from Dobric restored a double-digit margin, 70-59. But the visitors countered with Hanga's triple and Oriola's three-point play. Tomic scored twice from close range, and Heurtel nailed another three that got the visitors within 77-76. A fastbreak layup from Hanga gave Barcelona its first lead, 79-80. 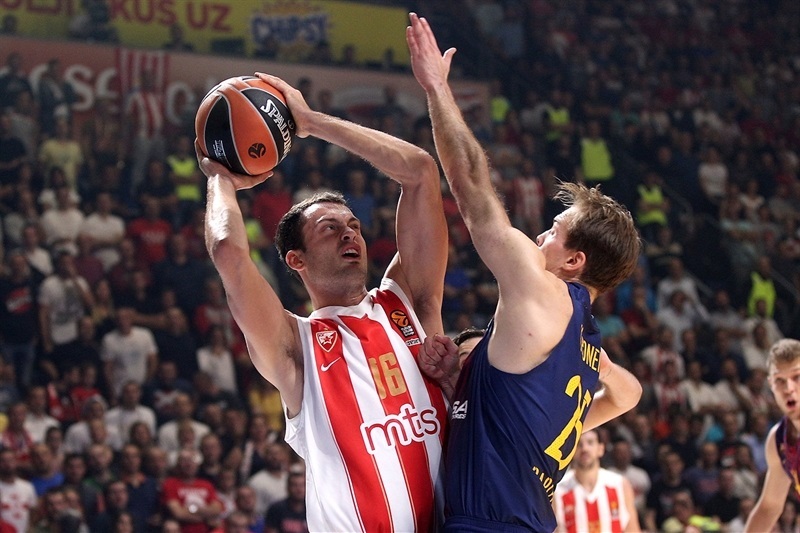 But Bjelica answered on the ensuing possession with a three-pointer and muscled his way for another basket inside, before Rochestie hit a runner that made it 86-82 with 83 seconds to go. The visitors did not score again, and Zvezda celebrated its first win of the season with its fans. 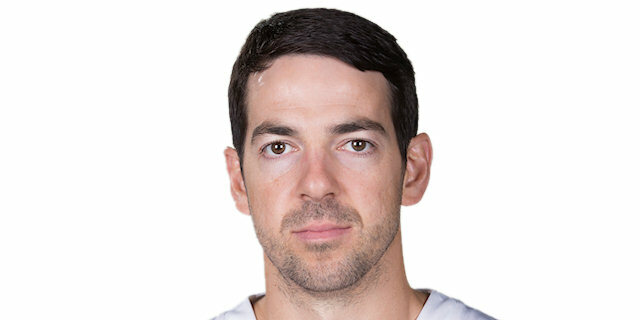 "We had a bad first half and carried that throughout the entire game. They had a stronger start, not giving up any loose ball as lost, and we trailed all the way in the first half, making a lot of mistakes that they punished us for. We played much better in the second half, with much more intensity. We managed to take the lead after trailing for many minutes, but in the end we made some mistakes and they scored some good baskets that allowed them to win the game. We cannot allow so many early mistakes, especially on the road, in such a tough arena as this. 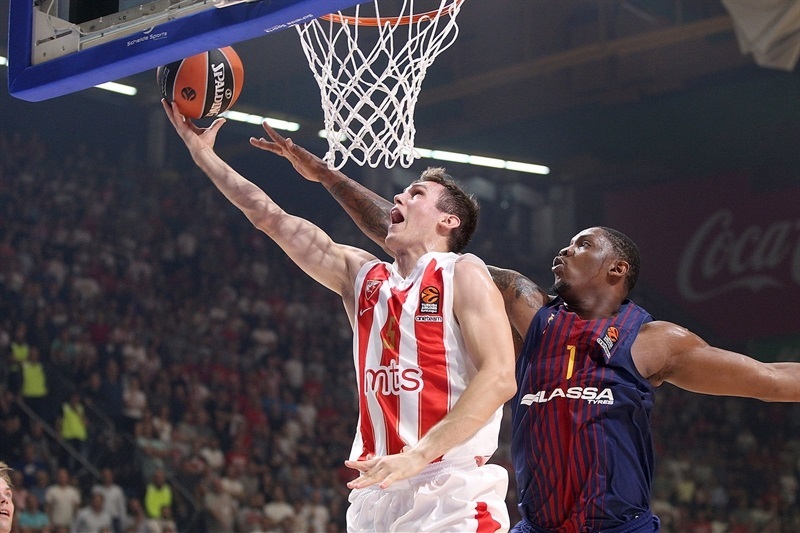 This is just our second EuroLeague game, the first one on the road, and we still have a lot of things to improve. The way we played in the second half is the road we want to go through."